These days more and more people are getting inspired by the importance of organic farming and are discovering the joy of gardening. Many households have started to cultivate their own organic vegetables and herbs in their backyard gardens. Gardening is not a boring or an old hobby anymore, youngsters have also started to soil their hands for the love of growing organic plants and food products. The increasing importance on healthy food consumption has once again shed light on in-home and organic farming, resulting in many youngsters takings up farming as their major studies or occupation. One of the greatest challenges faced by any gardener is pest control. It’s natural for the pests to dwell in good plants for their survival needs. Not all pests are dangerous and one or two bugs might not be a problem at all. They would simply chew on a few leaves and wouldn’t cause any major damage to your plants. But there are also other types of invasive pests that damage your plants entirely, making it wilt and die, or unfit for human consumption. It’s quite important for every gardener to keep the pests at bay to safeguard the plants. Why choose natural pest control? When you’re having your own in-home garden or growing some organic vegetables, pests might bring in big trouble. Going for chemical pest control techniques will get rid of the pests, but did you know that chemicals are also poisonous to us? If a chemical can be toxic to a living organism like bugs, beetles, insects, and other pests, it would definitely be harmful to our health as well. Recent studies show that the high-grade vegetables and fruits that are widely being consumed today are all genetically modified and exposed to high degrees of chemical pollutants for stopping the pests from invading the plants. If you follow the same at your home garden, then remember that these chemicals don’t just wade away the pests. But they can also lead to other complications, like polluting the soil and water in it, might also affect the birds that are natural pest controllers, pets and children around the house might get affected and face some health issues when they are exposed to these harsh chemicals, and more. These pests can be controlled in a more natural, chemical-free way and it’s the best for your surroundings and your plants. Natural pest control also ensures the safety of the food you consume and long-term it helps avoid many health complications that arise due to consumption or exposure to chemical gardening products. You also get to play a part in saving the ecosystem by stopping the soil, food web and ecosystem from getting polluted. 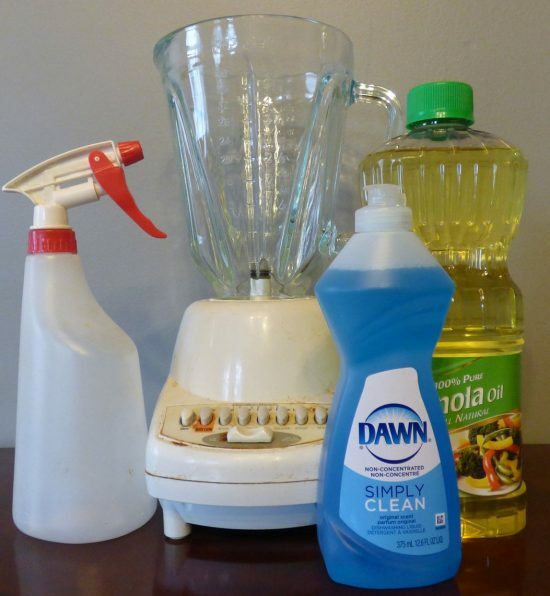 Common dish soaps and dishwashing liquids can be used as pesticides. You can make some homemade soap sprays and use them to control soft-bodied insects lurking in your garden. Many insects and pests, such as aphids, spider mites, whiteflies, common moths, and more can be reduced using dish spray soap. The soapy solution would break down the soft outer protective skins of these bugs and kill them in the process. It’s also found that soapy sprays, especially the ones containing some detergents, might greatly assist in pest control by affecting the skin of these insects and killing them. 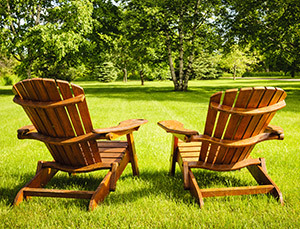 Some pests are simply allergic to the odor of soaps and stay away from your garden. However, there are chances for the soap spray to damage your plants as well. They might break down the cuticles on the plants or even leave a layer of soapy coat on them hindering their respiration. So make sure you don’t make any damage to the plants while driving away the pests. Try and test the spray by applying it on a few leaves and see the results. If the plants aren’t damaged then apply the spray all over the garden on the leaves and stems of the plants. Avoid using anti-bacterial or any other flavored dish soaps and stick with the less chemically treated ones. If your plants look dull after the treatment, you can very well wash them off while you water the plants. Common household cooking oils are great and safe way to control pests on plants. Buy any cheap salad oil or cooking oil from the supermarket and mix a few drops of these oils together. Make a spray by diluting the oil with water or some salted lime juice and spay the mixture on the leaves of the plants. This oily mixture works best on mites, nematodes, and many other hard-shelled insects, like beetles, grasshoppers, and more. The oily mixture will suffocate the insects and pests leading to their death or the lime scented oil will simply drive them away from your garden plants. This works best for indoor plants that often have some beetles or bugs crawling over them. If you’re planning to use the same on outdoor garden plants, make sure you spray them during the early morning or evening hours when the sun is down. Otherwise, the oil mixture might trap heat and burn the leaves during the afternoon. Coffee grounds have a great reputation when it comes to solving some garden troubles. It has been proven that coffee grounds and nuts have the ability to reduce a number of diseases in plants, get rid of some pests and plant worms, they also help in fertilizing the soil, and even ward off the slugs from your garden. 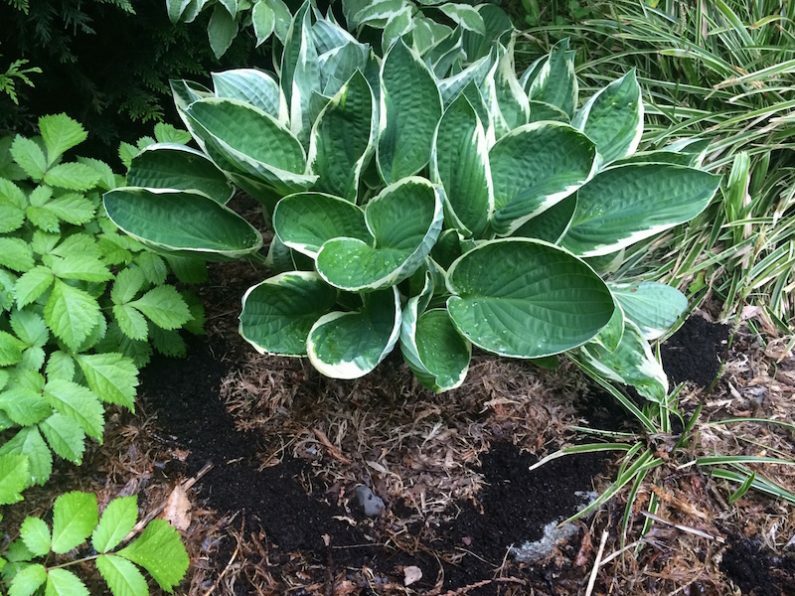 They are also widely used as mulch that doesn’t give way for the growth of weeds. Snails and slugs might prove to be a big trouble, especially during the mid-rainy and the winter seasons. They might cause a bit of nuisance by eating the plant leaves and any new foliage that arises. This will greatly reduce the growth of the plant and over time they might start wilting. Caffeine works best against these slugs and snails; it will simply kill the slugs or deter them from getting onto the plants. You can spread them on the soil over your garden or simply spray some on top of your plants. They last only for a few days and you’ll have to repeat the process quite often. Not only vampires from mythologies are allergic to garlics, some pests also detest garlic. Using garlic for pest control is one of the non-toxic, low cost methods that yields great results. Garlic is full of natural fungicidal and pesticidal compounds that are very effective against some major plant pests, such as beetles, ants, borers, caterpillars, armyworms, slugs, and more. You can both extract the garlic juices and dilute it to make a spray, or use it on the surface of the plants or even make a garlic drench for your plants. While you use garlic tea or diluted garlic water as a soil drench, it’ll greatly help in controlling the nematodes. When they get absorbed by the roots of the plants they’ll naturally start repelling codling moths, Japanese beetles, root maggots, and other such pests. If you’re using it on vegetable plants don’t spray them during the harvest time, else the vegetable will absorb the odor of garlic. While many natural insect and pest repellents are on the rise, a few “old reliable” have been popular throughout history. One such pest repellent is hot cayenne pepper. Many leaf eating pests are resistant to simple in-home methods of pest control or in time develop some resistance against these methods. Cayenne pepper has been used to ward off those stubborn pests, like plant mites, coconut beetles, oryctes, scarabs, and more. It’s better to go for pepper sprays rather than just spreading some dry pepper flakes or powders on the surface of the plants and soil. They might get swept away by the wind and carried over into your homes, causing allergic reactions. 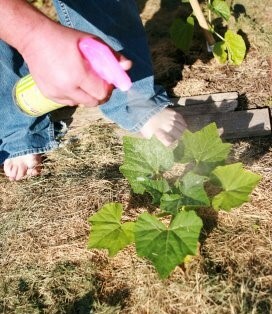 But pepper sprays will stick to the plants and wade away any beetle that’s trying to eat the plants. Make sure you water your plants and wash off the pepper on it within 2 days to avoid any damage to your garden plants. Egg shells are the best components to be added to your garden because they help both in pest control and in fertilizing the soil. Egg shells have been in use to curb slugs and snails from the garden for over a long time now. They provide organic pest control and are also found to be 100% effective against some kinds of pests. 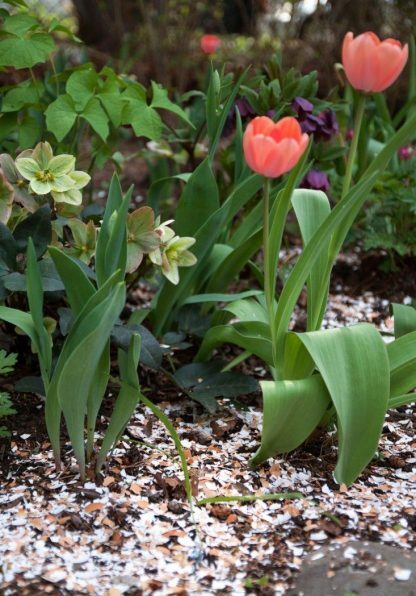 When the dried, powdered egg shells are spread across the soil in your garden, they will make an awesome organic pesticide and help kill Japanese beetles and make it impossible for the slugs to move over the coarse surface. You can apply it on the ground or even on the leaves, any pests in the vicinity will start wriggling, twisting, and turning unable to move. They will eventually die or leave your garden at once. While spraying the egg shell powder, be cautious and don’t rub the powder on the surface of the plants. This is because the egg shells make a coarse powder and might simply damage the plant. 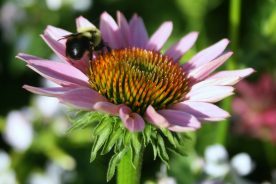 There are a wide range of essential oils and herbs that can be used for repelling the troublesome insects and other pests from your home garden. Rosemary oil is a potent repellent capable of driving away insect larvae, like small moth caterpillars, cabbage looper caterpillars, and more. This will help protect all the juicy vegetable foliage, like tomato, cucumbers, melons, and more. Peppermint oil works best in getting rid of aphids, white flies, ants, beetles, squash bugs, and some common plant fleas. Peppermint oil will also stop spiders and beetles from nesting around your garden. If you’re troubled by the number of roaches, chiggers, and ticks running all over your garden, you might want to try some thyme oil spray. Clove oil is another great all-natural pest repellent that drives away flying insects. If you’re troubled by some stubborn pest issues, then try using neem tree oil essential oils to drive them away. You can also plant a few useful herbs, like peppermint, thyme, sage, and more in-between the plant foliage because they will help in naturally driving away the pests from your garden. These natural oils will also enrich the soil and act as a fertilizer. Fences are the basic type of protection you can give to your garden plants. It will save your plants from grazing animals and other rodents that try to feed on them. Fencing will also help you organize your garden and gives a great look to it. 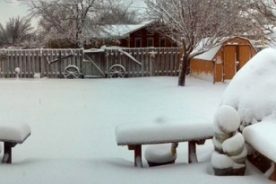 If you’re living in a region where there are many stray grazing animals, then you ought to make a strong fence to safeguard your garden plants and vegetables. If you have a small garden or live in a safer location, then you can afford to make your own fence. Both metal and wood fences can be made on your own. You also get a lot of DIY fence assembly kits that can be used for fencing your garden. Fence can also stop your plants from overgrowing and help organize your garden. Many different herbs and plants, like lemongrass, basil, thyme, mint, and more can naturally drive off the pests and insects. Basil can drive away the flies and mosquitoes lurking in your garden. Some types of moths and beetles can’t stand the scent of lavender and planting them in-between vegetation will keep away some beetles. Chives can also be planted if you are witnessing an increase in the number of carrot flies, aphids, and squash bugs in your garden. 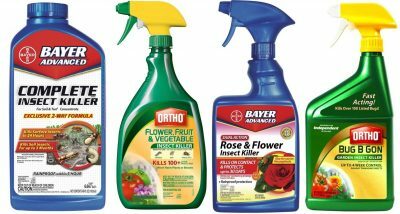 There are numerous DIY all-natural pesticides and insecticides that might come in handy, while you’re looking to deal with those nasty pests in a more natural, harmless way. Boil one whole bulb of garlic, one large onion, two bell peppers or cayenne pepper along with one liter of water. Once the ingredients are completely soggy and hard boiled, remove them and filter the water. Let it cool for some time. When the water is completely cool add a few drops of thyme and rosemary essential oil to it. Transfer the water to a container and save it for spraying on the pest infested plants. Dish detergent can also make a great pest repellent. Mix two tablespoons of dish washing gel and a handful of baking soda with 1 gallon of water. Spray this mixture on your plants during the evenings to drive away soft-skinned pests like aphids, spider mites, whiteflies, common moths, and more. Make sure you water the plants next morning so as to wash away the soapy deposits from their leaves, allowing them to respire without any hindrance. If you have some leftover coffee grounds at your home don’t just dispose it. 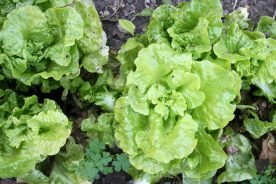 They can be of great use for controlling the pests in your vegetable garden. You can boil the coffee grounds along with a few gallons of water and use it as a spray or simply spread some coffee grounds on the soil. This will help keep away the beetles, or suffocate them to death. You can also add some ground egg shells along with the coffee grounds to drive away the slugs and snails. They will also fertilize the soil and help you by enriching the soil for the next cultivation cycle. Always remember that killing all the insects and pests isn’t the point here. Some insects and pests are much needed to maintain a healthy ecosystem and are very beneficial to your garden vegetation. Make sure to remove only the predatory, troublesome pests from your garden and do it using all-natural pesticides. This will ensure that your plants are protected in a more organic way and you get to play a huge part in safeguarding the environment.